The speed of Jet Deck, the mind of Doc O’Lena, and the ability of both of these legendary sires, have come together in Blazin Jetolena to achieve the ultimate barrel horse. His accomplishments are too many to list. His babies have earned nearly $14 million in NCHA cutting competion and more than $320,000 in reining. Shorty Freeman, Doc O'Lena's trainer was quoted saying "I didn't train Doc O'Lena anyway; he trained himself. I knew about 30 days after I got him that he was an exceptional horse. I always had to ride him last in the training program, 'cause if I didn't, I'd be be mad at all the other horses in the barn. He was just that good." In 1970, ridden by Freeman, Doc O'Lena won all four go-rounds of the NCHA Futurity, a record that still stands as this is written. AQHA and NCHA Hall of Famer, Buster Welch said, "Shorty did with Doc O'Lena in cutting what the guy who broke the 4-minute mile did for running: He opened the door." Doc O'Lena died in February 1993 at the Phillips Ranch in Frisco, Texas. 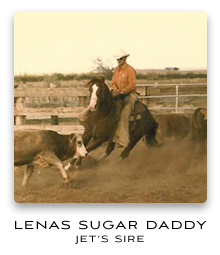 He was inducted into the AQHA Hall of Fame in 1997. Doc Bar will forever be remembered as the horse who revolutionized the cutting horse industry. But he was not bred to be a cow horse. A look at his pedigree shows speed, and that's what Tom and Jack Finley of Gilbert, Arizona wanted when they bred Dandy Doll to Lightning Bar, a AAA AQHA Champion son of Three Bars (TB). Doc Bar was not a race horse. He wasn't even a performance horse. But he turned out to be a good halter horse and an extraordinary sire whose get totally transformed the sport of cutting. And although he was never ridden in competition, his sons and daughters forever changed the cutting horse industry with their ability and style. They've not only found their way into the cutting arena, but other performance events as well - such as working cow horse, reining, roping, western pleasure and barrel racing. At the age of 21, the grand old horse sired his last foal, aptly named Doc's Last Chance, who was born in 1978. Sterile by that time, Doc Bar spent the remainder of his years in pasture with a favorite old mare. Doc Bar was 36 years old when he was humanely put down on July 20, 1992. Doc O'Lena's dam, Poco Lena, was the daughter of AQHA Champion Poco Bueno and Sheilwin, by Pretty Boy. Poco Lena was not only an AQHA Champion and Superior Halter Horse, she was also the first horse to be inducted into the National Cutting Horse Association Hall of Fame. She was the NCHA World Champion Cutting Mare in 1959, '60 and '61. Between 1954-1961, she was the NCHA reserve world champion cutting horse five times. By the time her cutting career ended, tragically and abruptly, Poco Lena had earned nearly $100,000 in NCHA competition - during an era when purses were little to nothing. 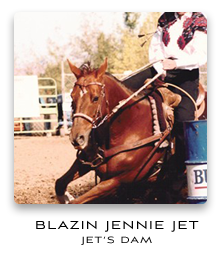 So great were Poco Lena's accomplishments, she was also inducted into the AQHA Hall of Fame. But fame did not ensure Poco Lena an easy existence. In 1962 her owner B.A. Skipper Jr. was killed in a plane crash on his way home from a cutting. A hired driver, who was to bring the horses home, left them in a trailer without food or water. In the mayhem following the disappearance of Skipper's airplane, it was days before the horses were missed and located. The episode nearly killed Poco Lena, and crippled her so severely she would never compete again. California horse breeders Dr. Stephen and Jasmine Jensen heard of the plight of the great mare, and decided they would like to purchase her. Their hope was to rehabilitate Poco Lena and breed her to their champion halter stallion, Doc Bar. However, when Poco Lena finally hobbled off the trailer in California, her condition was so pitiable that the Jensens' first inclination was to have her humanely destroyed. Veterinarian Dr. Frank Wayland persuaded the new owners to give Poco Lena one last chance. Dr. Wayland and Dr. Gary Deter worked tirelessly-not only on her feet, but also on her reproductive tract. Her ovaries were the size of peas from years of medication to keep her out of heat for the show pen. On June 21, 1967, Doc O'Lena was foaled on the front lawn of the Jensens' Double J Ranch. The following year she gave birth to another bay colt sired by Doc Bar, Dry Doc. Dry Doc was the last foal the legendary Poco Lena would produce. On Dec 16, 1968, a few months after the colt was weaned, Poco Lena was put to sleep. Poco Lena's legacy, however, continues to be carried on through the many champion performers whose pedigrees boast her name. War Chic, by War Bam (TB) and out of the great mare Chicado V, was the 1958 Quarter Racing World Champion 2 year old colt. Chicado V left her timeless mark on the Quarter Horse breed through her sons and daughters, among whom included: Triple Chick, War Chic, Table Tennis, Three Chicks and The Ole Man. His name held prestige, and he lived up to the honor. Even the big, white star on his forehead predicted his future. One could honestly say he was one in a million. Given the longevity of Jet Of Honor's breeding career, the chestnut son of the immortal Jet Deck has dominated the barrel racing industry like no other stallion. He was the complete package for a barrel horse sire. He was out of Quincy Liz, a daughter of Lightning Bar, and out of a daughter of Leo. Sure, there may be sires whose offspring have won more, thanks to the boom in the barrel racing industry, but no other sire has had the sheer number of winners. From notable trainers like Ed and Martha Wright and Bobby Stivers to your backyard barrel racer, the offspring of Jet Of Honor has won for all of them. In Stiver's words, "The Jet Of Honors are easy to ride; you just have to let them work. They want to do it on their own. You don't have to have a lot of bridle. You just position them toward the pattern and go, they are just naturals." And Stivers has ridden a few. He recollects that he has had 250 different Jet Of Honor offspring come through his barn in Scottsville, KY.
Jet Of Honor was bred by Robert W. Moore of Norman, OK, and was foaled in 1971. In 1975, he was purchased by William Robinson of Okanagan Falls, British Columbia, Canada. Jet Of Honor was a stakes winner himself. With a high speed index of 102, he won eight races out of 24 starts, had three second places, recorded two thirds, set a new track record for the 350, and earned $15,780. Jet Of Honor stood at stud in Canada from 1975-85, alternating years between there and Kennewick, Wash. In August 1985, he was purchased by Dan and Charlotte Dailey, Tupelo, OK where he remained until his death in 1995 at age 24. Jet Deck was the first Quarter Horse to win in excess of $200,000 on the track. Among his legendary offspring are Jet Smooth, Jet Deck Junior, Easy Jet, Mr. Jet Moore, Possumjet, and Jet of Honor, all of whose winnings total nearly $7 million. By 1971 Jet Deck was, at the relatively young age of 11, a leading race horse sire whose star was on the rise. In the words of Bud Warren (co-owner of Jet Deck) "Everyone who was breeding to him was making money." In the early morning hours of August 26, 1971, Jet Deck was found dead in his paddock at the Warren Ranch. An extensive post-mortem examination revealed that Jet Deck died of a massive injection of barbiturates into the jugular vein. The responsible party has never been apprehended, and the case has never been solved. In the words of Wilber Stuchal, Jet Deck's original owner, "His loss to the horse breeding industry can't be evaluated. As far as I am concerned, there aren't enough adjectives and words in our language to describe his loss to the horse breeding industry. He had great conformation, great drive and determination, and the best coordination of any horse I've ever seen in my life." Few things have changed since Stuchal offered those words in 1972. Jet Deck's loss to the industry is still viewed as a major one, and the mystery surrounding his death has never gone away.